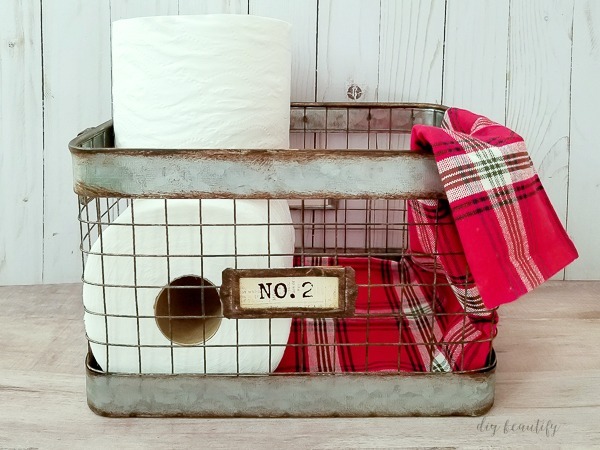 Put guests at ease and keep the bathroom smelling fresh all season long with a pretty guest basket! Friends, we're going to get real here today and talk about an embarrassing topic, a topic that nice girls usually don't discuss in public! The subject today is poo y'all and you're going to need your sense of humor. So if it's still sleeping, go pour yourself another cup of coffee and come on back. A. Because it was stuck in a crack! If you're married and/or a mom of young ones, potty humor is just part of life! But it's not always humorous! Christmas is the most wonderful time of the year! And one of the very best parts about the holidays is being a guest at someone's home and inviting others into our homes. Sharing food, stories and laughs draws us together like nothing else can. But let's face it...when you feel the urge to GO, and yes, I'm talking No. 2, it can be a very embarrassing situation when you're a guest at someone's home...you've got a dilemma on your hands! Do you force yourself to hold it in (thereby ruining the rest of your evening), or do you allow yourself to stink up someone else's bathroom? Poo might be natural and we know we all do it...but it's a private thing that we certainly don't want to broadcast to the entire party! No one wants to be the one who stinks up the bathroom at a party! Unless you have teenage boys. They might be the only ones who can be proud and brave in this situation! A stinky bathroom is definitely embarrassing, but thank goodness there is a solution! Poo~Pourri is the "Before-You-Go® Toilet Spray" that effectively traps the stinky situation, leaving nothing behind but a pleasant aroma! I'm a mom of 3 and I'm married. Right there you know that I've pretty much smelled it all...and I'm not talking about stinky socks! 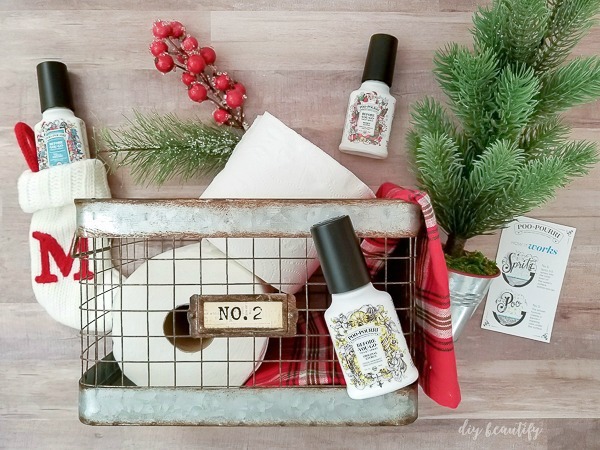 I love using Poo~Pourri because it really works and the Holiday Poo~Pourri products are the perfect side-kick for this season of entertaining! When you spritz before you go, the pure blend of natural essential oils creates a film over the surface that effectively traps smells under the surface...so no one need ever know! All they smell is Christmas! There are dozens of scents and gift ideas (stocking stuffers, ornament sets, etc) available at poopourri.com and it's really a fun website to visit! I'm sure you know someone who could benefit from a gift of Poo~Pourri! 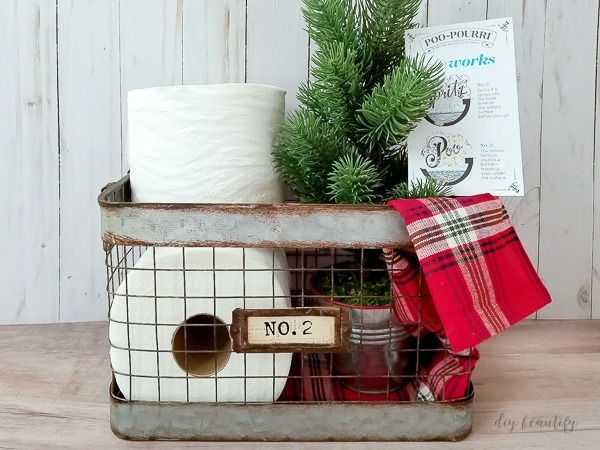 A simple and festive holiday guest basket will put your guests at ease, especially if you include the instruction card so they know to spritz before they poo! 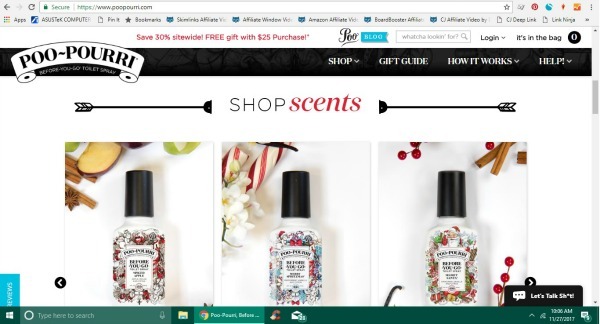 Poo~Pourri has offered diy beautify's readers an awesome discount code. 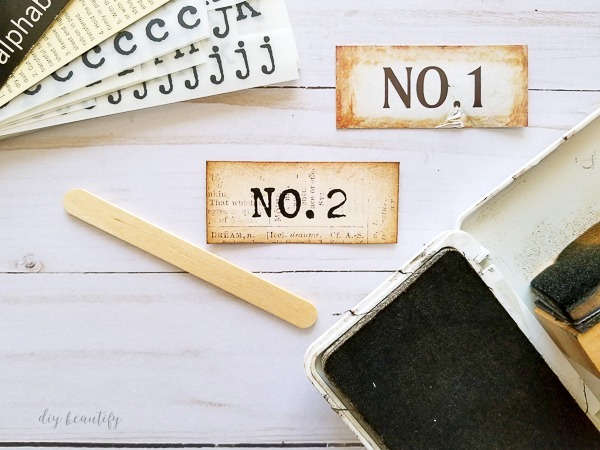 Click HERE and use the code DIY for 20% off your entire order. You can hover over the image below to purchase the products directly on the Poo~Pourri website. 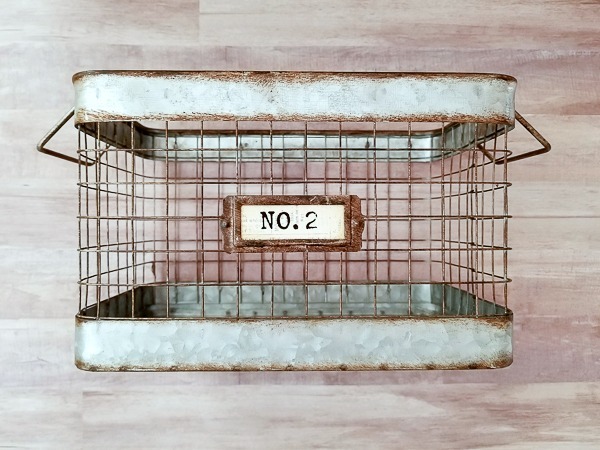 Start with a great basket. 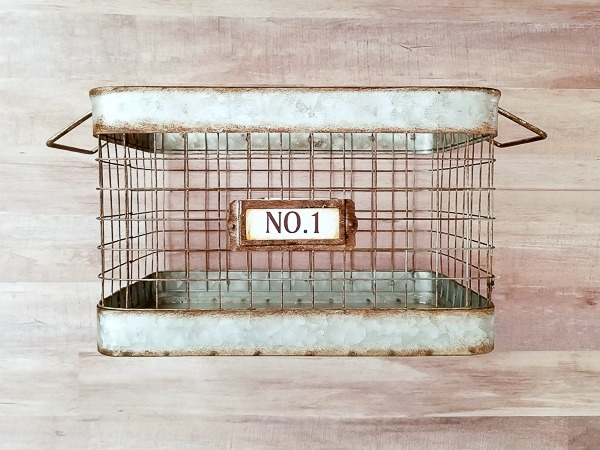 I was drawn to this one because of the label-holder. I've got a sense of humor, so I decided to change it to read NO. 2! and slid the label into place. It's a subtle hint, pointing the user toward the other contents! Then I added a festive plaid napkin. 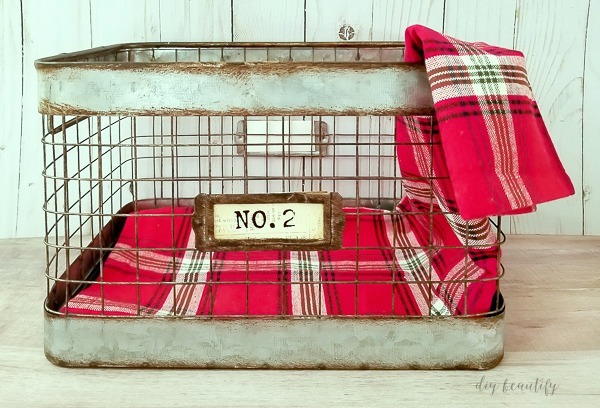 You could use a hand towel or even a piece of folded fabric. I added a couple rolls of toilet paper. And tucked in a small potted Christmas tree. I didn't forget the instruction card (that comes with your purchase) that reminds guests to spritz before they go! And lastly, I added a bottle of Merry Spritzmas® Poo~Pourri spray, a blend of Peppermint, Vanilla and Citrus essential oils that smells like Christmas! 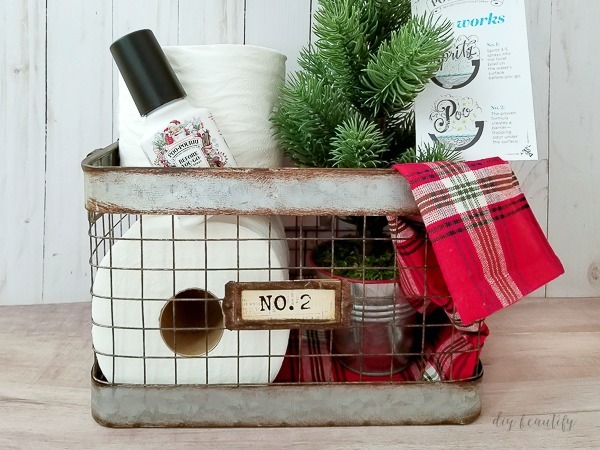 This basket is festive and fun...and sure to ease the potential embarrassment of holiday guests and keep the bathroom smelling great! 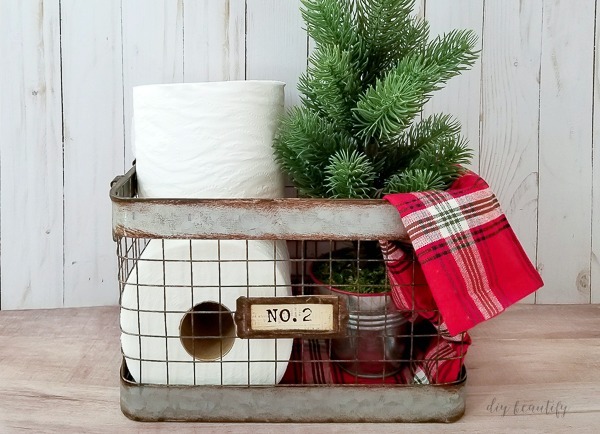 PIN THIS IMAGE if you want to keep your bathroom smelling fresh during the holidays...and beyond! I hope you enjoyed this light-hearted approach to stinky smells 😉, but more importantly, I hope you keep a Poo~Pourri filled guest basket handy this season!